I knew what was going to happen next. I was going to college. Just like my brothers. Just like many of my friends. This was one expectation I had carried and talked about for years. And it became a reality. My disability wasn’t going to stop me. After college, I started a new story. It began like this — I returned to my hometown and my parents’ home. I expected that part, but I had never really thought beyond that part. There were dreams I hadn’t named yet, expectations that affected the way I lived and hoped for the future. I wanted to live on my own and I wanted to get married. Just like I’d seen many of my friends and one of my brothers do. These are normal dreams. As much as I wished for independence to look a certain way, I needed to let go of comparing college life to current life. It took a few years. I learned to accept my place, love my home again, and be content. With contentment comes a resting in where God has me and what God IS doing. Right now. The present became more important than the future. I was no longer putting my hope in a certain future. One thing — I needed to learn to see my reality. 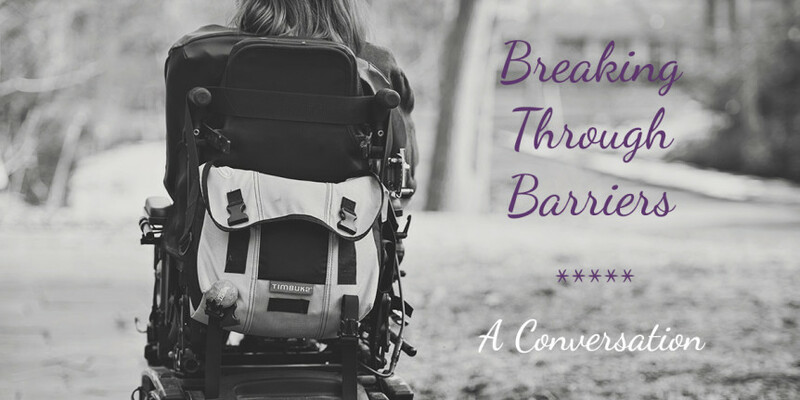 I needed to see the limitations that come with the Arthrogryposis. And name the simple dreams I had been carrying around for years. When you are born with a physical disability, you don’t necessarily consider the questions of why you feel frustrated at times or what you really wish you could do. You do what you can and that seems like enough. Expectations are constantly in our hearts. The limits we face can conflict with those expectations and what we hope will happen. Some limitations can change, but we can’t always erase them. Whether physical, mental, emotional, relational, or spiritual, we can reframe the way we see our limitations. We can also let go of the expectations that might be holding us back from the life God wants us to live. As I “see” my disability, and all the limitations, I see the whole me. This is how God made me. This is my normal. Embracing my self and my life brings a new, deeper perspective. It matters less that some of my dreams remain unfulfilled. I am moving away from my plan and moving forward into God’s plan. The dreams are still in my heart, but they are not my focus. Whatever the future holds probably isn’t what I expect. But that’s okay. It will be good. My job is to keep trusting and relying on God to lead me on His path. And I’ll gladly take others on the journey with me. Because I need them in the day-to-day. Then I can continue to live beyond my limits and embrace the story that is much bigger than anything I can hope, expect, or imagine.